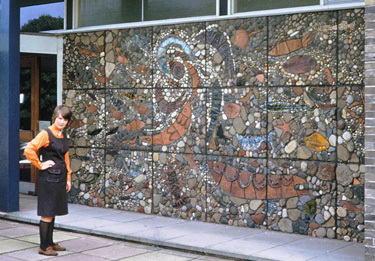 Philippa Threlfall has been making relief murals in ceramic since the 1960s. Together with her husband and partner Kennedy Collings she has completed over one hundred major works on sites all over the United Kingdom and overseas. Some of these were made for private clients, but most were commissioned for display in public situations - shopping precincts, banks, building societies, an airport, hospital and office developments. They lived and worked in Wells, Somerset, where they had a medieval cottage within the Liberty of Wells Cathedral. 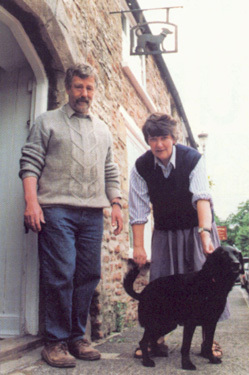 The property had been a cider house called Ye Blacke Dogge in the early seventeenth century, and Philippa and Kennedy named their business Black Dog after this medieval name. Philippa studied Illustration and Ceramics at Cardiff College of Art and went on to qualify as an art teacher at Goldsmiths College London. She taught ceramics and painting part time for six years at North London Collegiate School in Edgware, and during this time began to receive commissions for mural work. 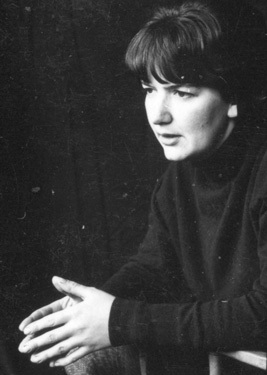 She left London for Wells in 1967 to marry Kennedy. He had trained as a historian at Trinity Hall Cambridge but was at that time still working for C & J Clark, the shoe company, whose head quarters were and still are in Street in Somerset. After one year Kennedy left Clarks to join Philippa making murals. He had become fascinated by materials and techniques whilst working for Clarks, and his interest and skills worked in excellently with those of Philippa in design and modelling. 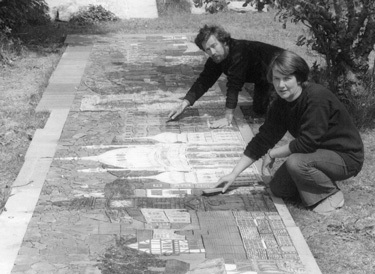 They built a large studio behind the medieval house and together worked out new and often original approaches to making relief ceramic murals. Although they did some smaller panels which they sold through various exhibitions, their work during the sixties, seventies and eighties came mostly from commissions. A number of development companies and building societies commissioned several different murals such as the Buildings of Sussex shown here. This in turn lead to exposure in the architectural press and a wider public, and further work came in from many different directions. New or previous clients (or their architects) would approach Philippa and ask for thoughts on the design of a new scheme. When approached for these initial design ideas, they always wanted their work to be sympathetic to the site, providing local interest with a sense of place and relevance to the viewer. This usually meant a visit to the site and a day or days spent researching the area. Their shared interest in history influenced their approach to design. Often, the resulting murals involved architectural facades, figures in an historical context, mediaeval maps and locally researched artefacts. Other themes might include coats of arms or natural history and the murals often had lettering incorporated into the design. 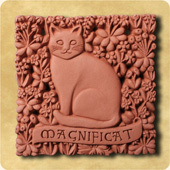 The medium has always been terracotta and buff clays imprinted and textured and modelled in low relief. 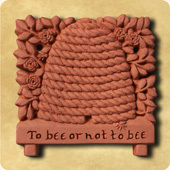 The ceramic is fired right up at the top of the earthenware spectrum (over 1100°) with selectively applied glazes. Philippa always mixed her own glazes, using natural oxides producing soft rich colours which sink into the textured surface adding richness and detail. 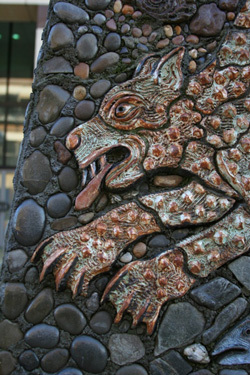 As well as ceramic, the murals often included natural stone, aggregate, pebbles and slate as in the detail shown here from Exploration Obelisk at Redcliffe Quay in Bristol. The combination of stone and ceramic proved a vandal-proof surface, and the accessible subject matter and tactile qualities of the works has always seemed to attract a wide cross-section of people. In the eighties, Kennedy worked out a way of reproducing smaller pieces of terracotta, making small decorative tiles of great intricacy. This was the business which they called Black Dog of Wells. From being a profitable sideline, this part of the business developed into a thriving concern. Kennedy died in 2002 and Philippa still lives and works in the new house with workshops which they built opposite their original medieval property. Philippa continues to design and make murals, together with panels in the same medium for domestic settings. She now works with her son Daniel who runs the Black Dog business. Each year Philippa adds new designs to the range, which now sell through the retail trade throughout the country and in the States. 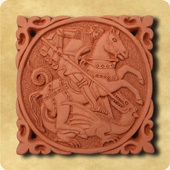 These designs can also be seen on our website www.blackdogtiles.com.